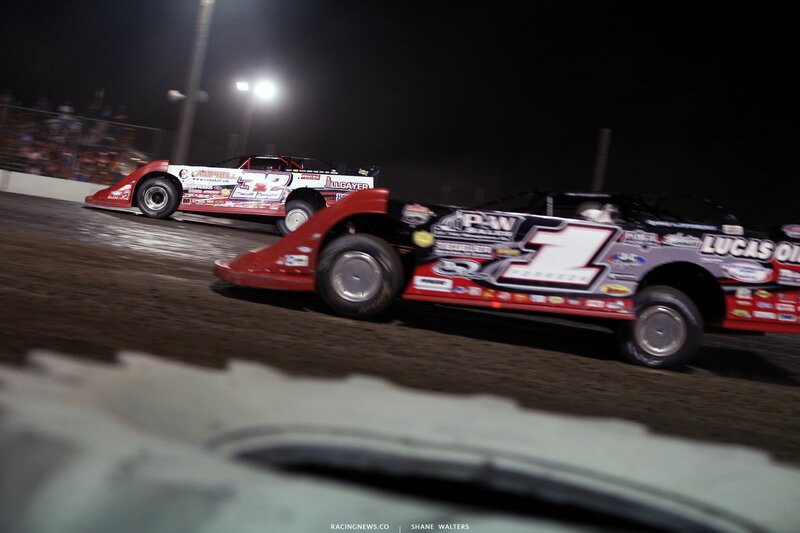 Tonight, the national dirt late model tour returns to South Dakota. 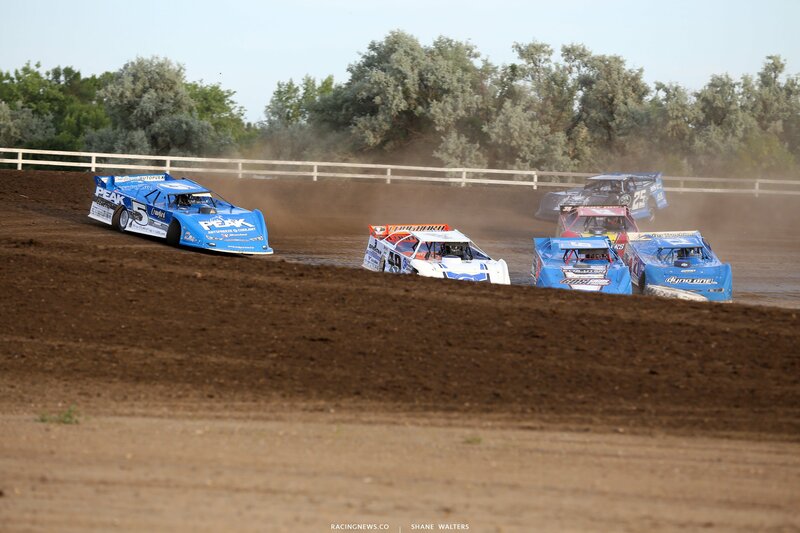 Last year, the tour made their debut stop in the Southern version of the Dakota’s via the 3/8-mile high banked oval. Now, they are currently in the pit area unloading for the second addition in history at Brown County Speedway. 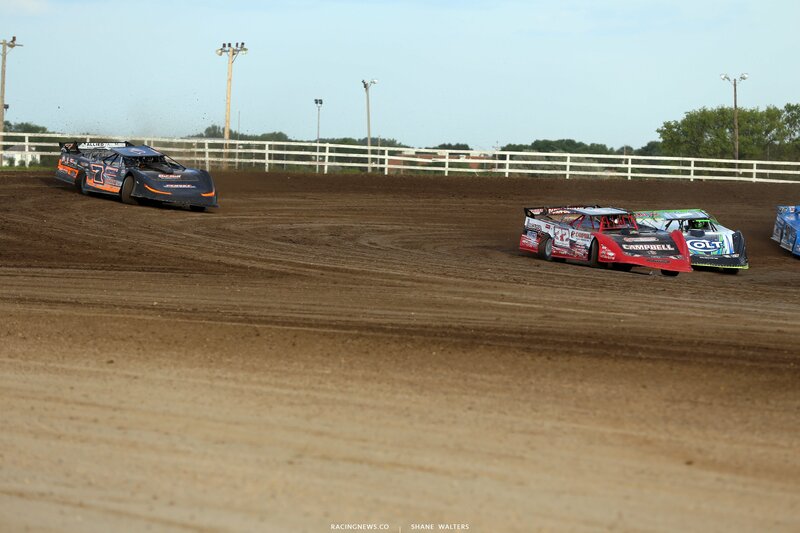 View full 2018 Brown County Speedway results below. Scott Bloomquist is quickest in hot laps. 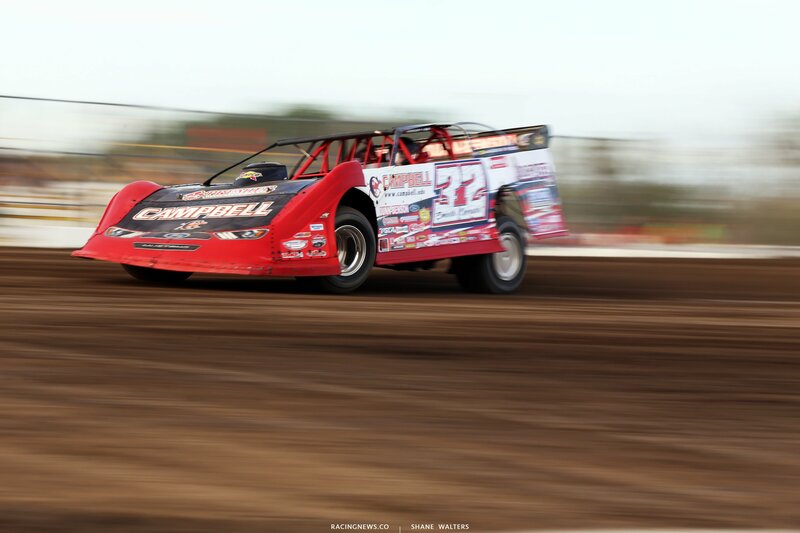 He circled the 3/8-mile dirt oval at 13.660. Bobby Pierce is making his first appearance here. In fact, he’s never raced in South Dakota. Despite that, he grabs the pole position with a 13.771. Scott Bloomquist’s time was disallowed from his qualifying attempt. He made laps with an unmarked right rear tire. Officials stamp approved tires before the night begins. They are required to use marked tires for the duration of the event. 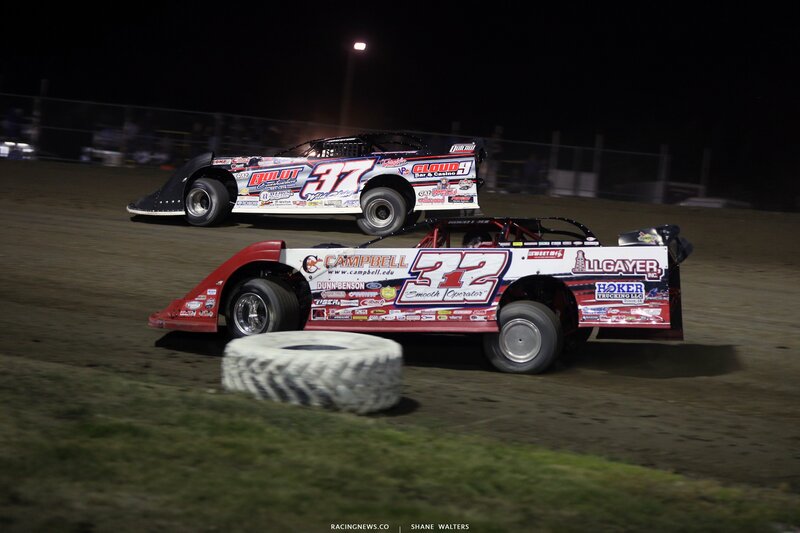 Bobby Pierce and Ricky Weiss will lead them to the start in the first heat race of the night. Green, Weiss to the top in turn 1. Weiss noses ahead on the entry. Pierce makes it all back on the bottom off turn 2. Pierce leads into turn 3. Weiss comes off turn 2 even with Richards for 2nd. Weiss carries the momentum off the top, he beats Richards to the bottom in turn 3. Pierce begins to drive away. He wins heat race number 1 by 10 car lengths! 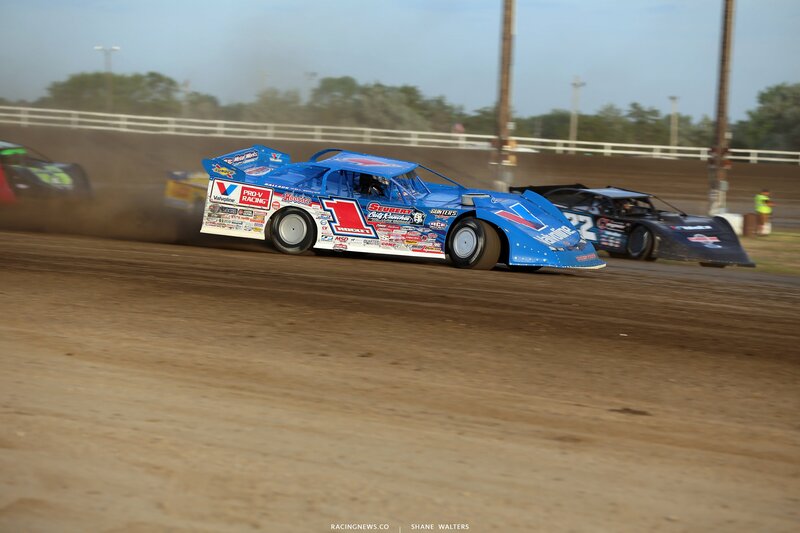 Scott Ward and Brandon Sheppard trail the pace truck ahead of heat race number two. Green, Ward gets the jump. He leads by a half car length into turn 1. Sheppard is trying to make time back around the top. He dips the right rear over the banking. Sheppars runs wide down the back, they’re looking inside, he holds them off in turn 3. Spin back in turn 3, the caution is out. Green, Ward leads. Satterlee attempts the top but he loses positions. Ward jumped out to a few car lengths early. However, Sheppard has closed to his bumper. They run nose to tail. Ward, Sheppard and Earl Pearson Jr. Nobody makes a move. Ward takes the win in heat race number two! Jonathan Davenport and Don O’Neal set the front row for the final heat race of the night. Green, Davenport noses ahead of O’Neal on the bottom. 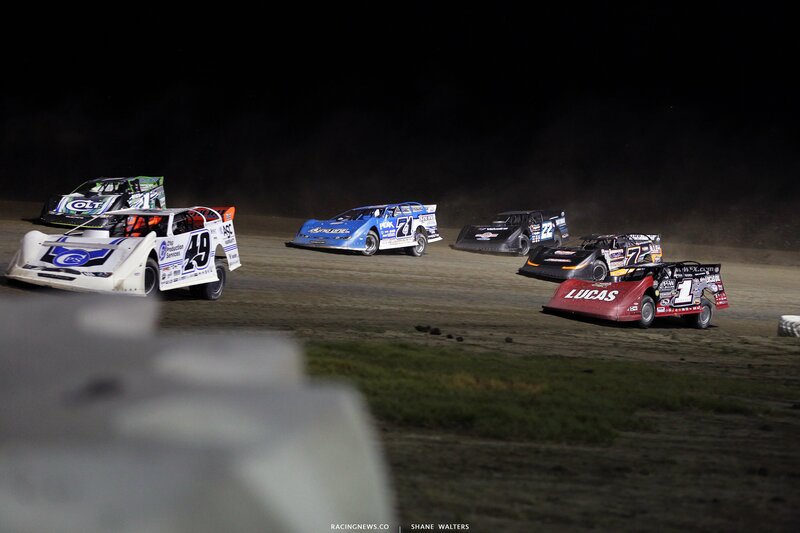 Hudson O’Neal, Tim McCreadie and Mason Zeigler run 3 wide for 4th. Zeigler jumps the cushion. The field heads to the bottom lane. Davenport is driving away for O’Neal. 2nd, 3rd and 4th run nose to tail. 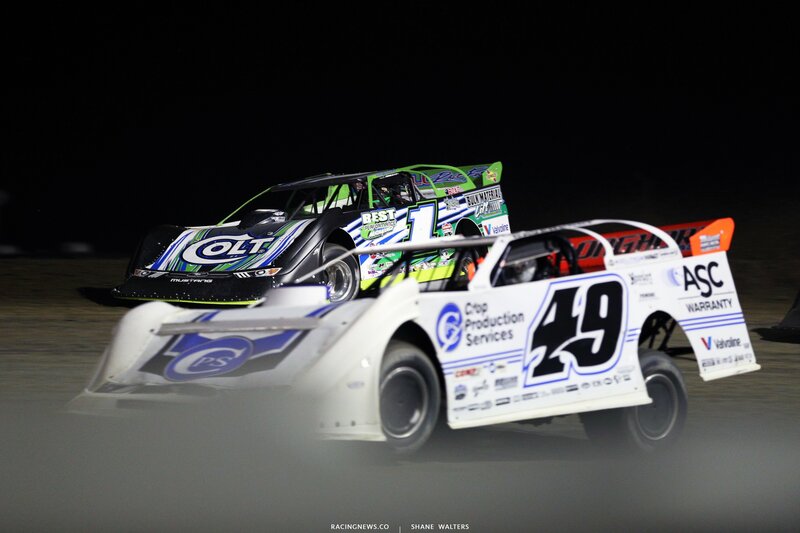 Bloomquist started at the tail, he’s still there. Jonathan Davenport drives away to win the final heat race of the night! A little bit of farming ahead of the main event. They’re mixing up the cushion and dropping water from top to bottom. Street stocks and modifieds will run first. They’re poking more holes at the top of the track just ahead of the start. That’s followed followed by a sprinkle from the water truck. The top lane is the only lane that was touched. Green flag, Ward and Pierce are even into turn 1. Ward takes the lead on the top off turn 2. Lap 2, Pierce and Weiss both move to the top. The entire top 5 is running in the part that was just watered. Lap 11, the leaders race through lap traffic. Move Pierce to the lead. Pierce opens up a gap. 22 to go, Ward slides a lapper in turn 3. He slides across his nose and crinkles the right rear. 21 to go, the right rear tire has explored on the Ward machine. He pulls to the pit area. No caution. 16 to go, Brandon Sheppard has climbed the banking in turn 3. He exits the track and the caution is out. Sheppard returns with no damage. Pierce now leads Davenport and Hudson O’Neal. Hudson O’Neal started 15th! Green, Hudson O’Neal purposefully takes a lazy start. He wants to slot in behind Davenport in 3rd. He forces his way to the bottom lane in turn 1. They stack up behind him. They’re into the rear bumper of O’Neal as he’s pushed back up the hill. Davenport to 2nd, Richards 3rd. They run 3 wide for 2nd. Richards and Davenport make contact! Davenport is in trouble. More trouble in turn 1 as he jumps the cushion. The next lap, Davenport and Satterlee make contact in turn 4. Satterlee is hooked and sent off the track! The caution is out. Davenport is chasing down Richards under yellow! He catches and swerves to show displeasure. I’m not sure if they made contact under yellow or not. 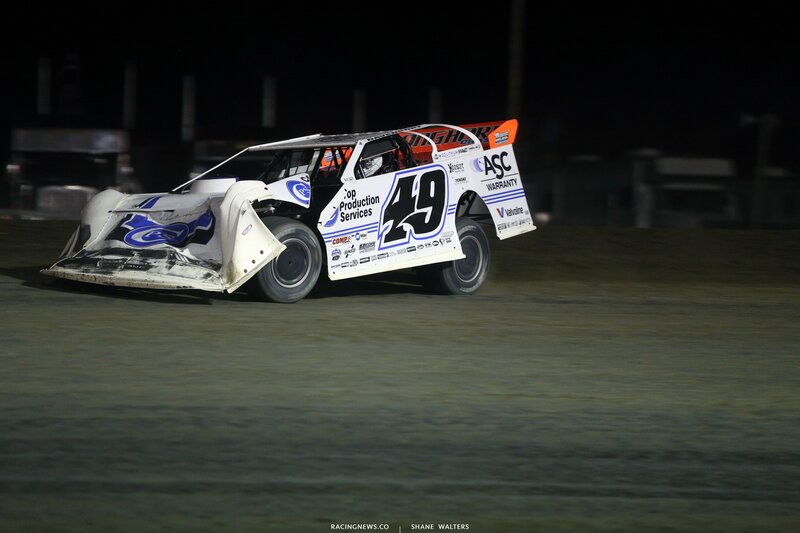 Davenport clams, he pulls to the inside of turn 4 as officials pull back on the bent fenders. Green, Earl Pearson Jr is coming on the bottom! 10 to go, Pierce and Pearson run side by side for the lead. Pearson noses ahead. Pierce hangs on his right rear. Pierce takes it back. 5 to go, Pierce leads by several car lengths. Trouble, Pierce is up in smoke! Pearson takes the lead! Earl Pearson Jr wins at Brown County Speedway! “We fell back to seventh or eighth there for a while. We had to get to the bottom of the track. When we restarted in third, we got high in turn one and I knew I had to get back down low. Bobby was giving it all he had there up top. I could see him and hear his motor and then he disappeared. 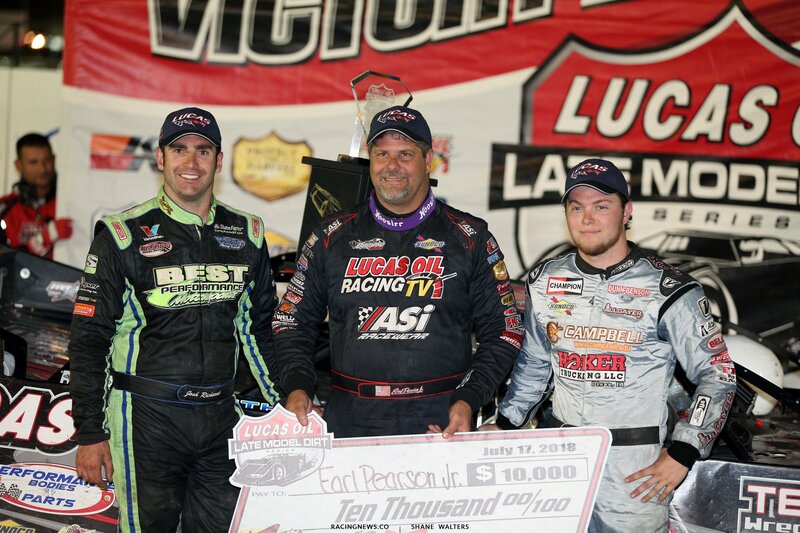 It was a good points night for sure,” race winner Earl Pearson Jr stated from victory lane. Josh Richards: The thing Josh Richards did in his post race interview was apologize to the #49 driver. He then talked about his run. “I hope the fans enjoyed that race. Thanks to everybody who came out tonight. They re-worked and watered the track and that sure helped. I didn’t know after the heats what it would be like if they hadn’t done anything, but thanks to the track crew. It was a great race,” second place finisher Josh Richards stated from the podium. 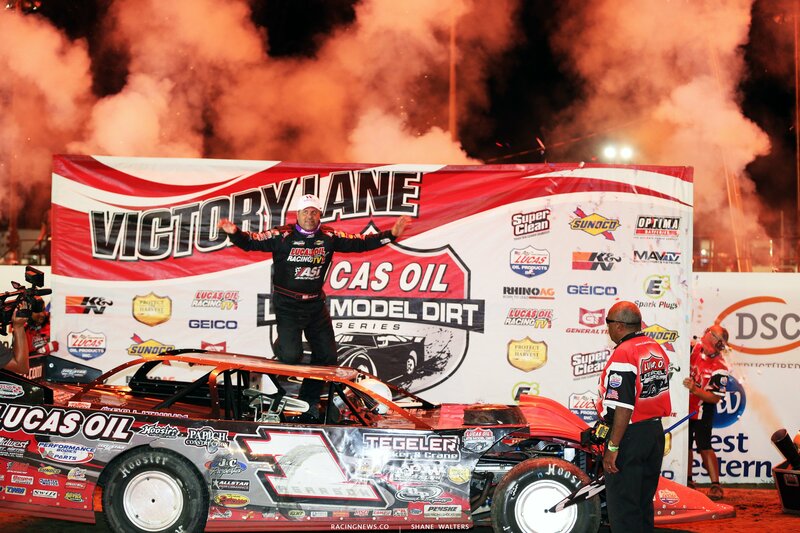 Bobby Pierce: Pierce crossed the line with smoke to finish in 3rd. He lost 2nd off the final corner to Josh Richards. He then parked the car 100 feet beyond the start finish line. With steam pouring from the engine, Pierce climbed out and threw the steering wheel back into the car. Pierce says his throttle pedal was stuck since lap 5. He was pulling back on the pedal to let off the throttle when he needed. That’s why he was glued to the top the entire race. The high side was the the only lane Pierce could run with a stuck throttle! It lasted 45 laps but it couldn’t make the distance. Pierce cooked the motor in the closing laps. View full Brown County Speedway LOLMDS results below. Tomorrow night, the tour heads slightly east for the Jackson Motorplex. 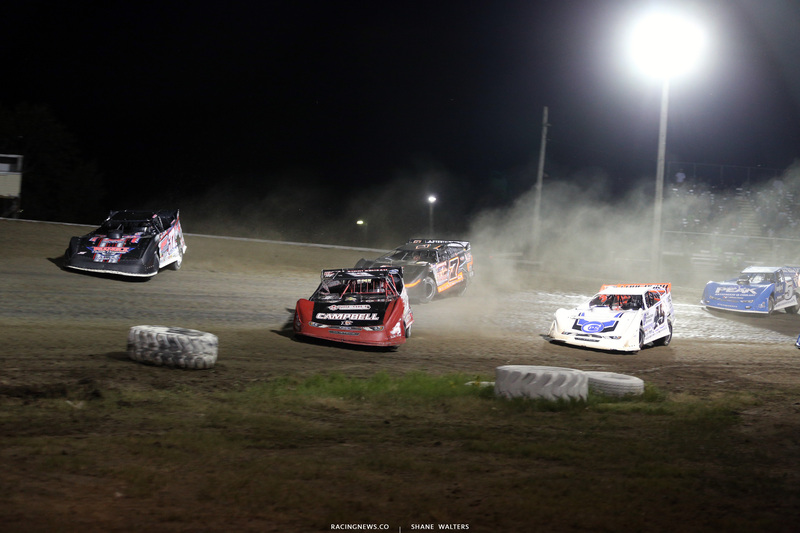 On Thursday, the tour returns to I-80 Speedway for a mini marathon at the Nebraska dirt track. The NE track will feature a Thursday night special followed by a separate two day show on Friday-Saturday.